Captain Sahír engages the first player. For each point of damage Captain Sahír would take, discard 1 resource from him and cancel that damage. 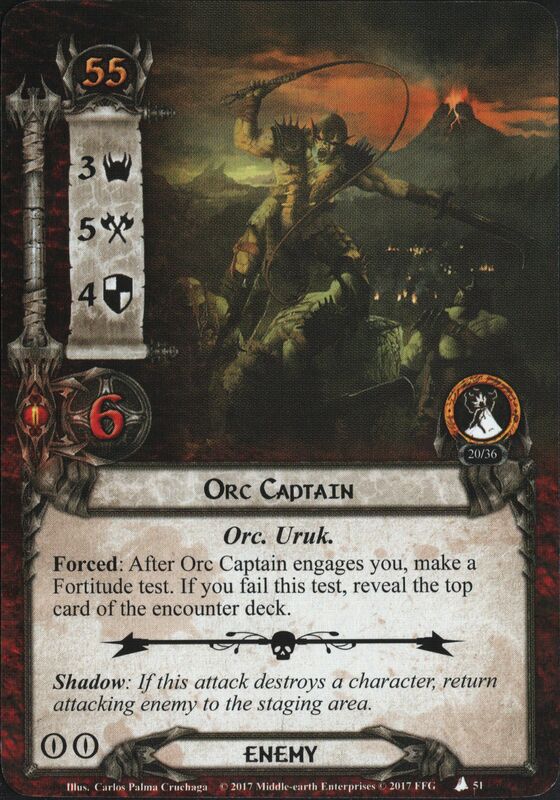 Forced: After Captain Sahír attacks, place 2 resource tokens on him (4 instead if his attack destroyed a character). The first player gains control of Captain Sahír. Captain Sahír gets +1 Willpower and +1 Attack for each resource on him (max +6). Action: Spend 1 resource from a hero you control to place 1 resource on Captain Sahír. (Limit once per round). If Captain Sahír leaves play, the players lose. Captain Sahír engages the first player. For each point of damage Captain Sahír would take, discard 1 resource from him and cancel that damage. For every 5 resources on Captain Sahír, he makes an additional attack against the engaged player each combat phase. Attach to a Warrior hero. Response: After you optionally engage an enemy, exhaust Captain of Gondor to give attached hero +1 Attack and +1 Defense until the end of the round. Forced: After Captain of Harad engages you, each Harad enemy gets +1 [Attack] and -10 engagement cost until the end of the round. Shadow: If this attack destroys a character, return attacking enemy to the staging area. Each enemy gets -20 engagement cost. Shadow: If this attack destroys a character, attacking enemy cannot take damage this round. Shadow: If this attack is undefended, attacking enemy gets +2 Attack if it is a Scout. Response: After Pelargir Ship Captain enters play, move 1 resource from the resource pool of a hero you control to another hero's resource pool. While you are engaged with Umbar Captain, characters you control cannot attack Ship enemies. While Southron Captain is in the staging area, each other Harad enemy gets +1 Threat. While Southron Captain is engaged with you, each other Harad enemy engaged with you gets +1 Attack. Cannot have attachments. Allies with fewer printed hit points than Uruk-hai Captain cannot defend against Uruk-hai Captain. Cannot be optionally engaged. If the active location is a Ship, Corsair Captain gets -30 engagement cost and gains: "Forced: When Corsair Captain engages you, it makes an immediate attack." Dusk. Shadow Host Captain gets +1 Attack and +1 Defense. Midnight. Shadow Host Captain gets +2 Attack and +2 Defense. When Revealed: Put the topmost Orc enemy in the discard pile into play engaged with you. Each Harad enemy in the staging area gains archery 1. Each engaged Harad enemy gets +1 Defense. Shadow: Attacking enemy gets +1 Attack (+3 Attack instead if it has the Harad trait). While Captain's Quarters is grappled, Raider characters are considered to have no resources. 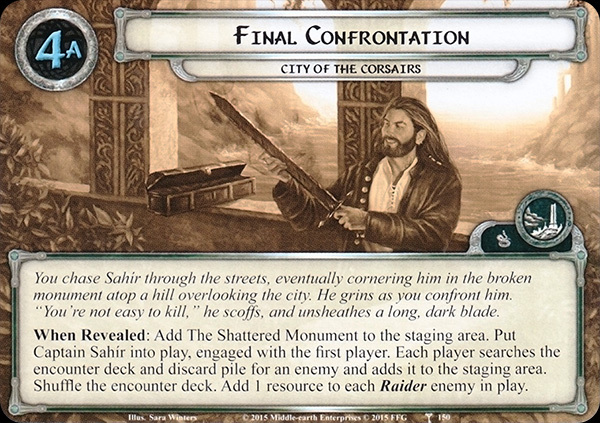 Travel: Add 2 resources to Captain Sahír (even if he is out of play) and 1 resource to each other Raider card in play. Resource Action: Exhaust a Noble hero you control to add 2 resources to that hero's resource pool. Quest Action: Until the end of the phase, each Noble hero gets +1 Willpower and does not exhaust to commit to the quest. Forced: After Murzag attacks, reveal the top card of the encounter deck. If that card is an enemy, put it into play engaged with the defending player. Forced: When Lord Alcaron attacks, place 1 progress token on To the Tower. Forced: When Lord Alcaron is dealt a shadow card with no shadow effect, he makes an additional attack after this one (deal and resolve another shadow card). Cannot have attachments. Reduce any amount of damage dealt to Nazgûl of Minas Morgul to 1. When Revealed: Raise each player's threat by X, where X is the number of shadow cards in play. If Thaurdir is Captain side faceup, flip him. Cannot have attachments. Each other enemy gets +10 engagement cost. Forced: After Thaurdir is flipped or a treachery card with the Sorcery trait is revealed, deal 1 shadow card to each enemy in play. When Revealed: Add Na’asiyah and Captain Sahír to the staging area, enemy side faceup. 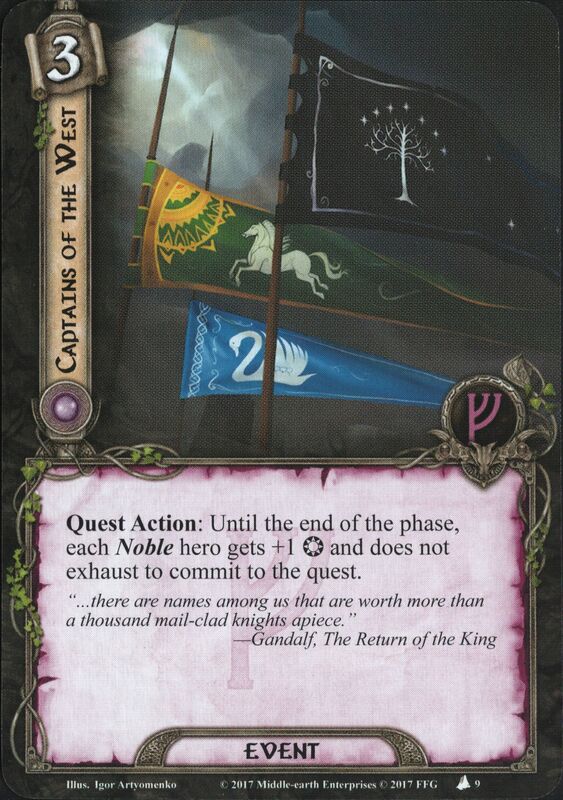 Each player reveals the top card of the encounter deck. Place resources on Na’asiyah and Captain Sahír equal to the amount of damage on The Dream-chaser. Add 1 resource to each other Raider enemy in play. Any time players would place progress on this quest, remove an equal amount of damage from locations in play instead. (Progress is placed on the active location before triggering this effect.) Each Raider enemy revealed by the encounter deck enters play with 1 resource on it. 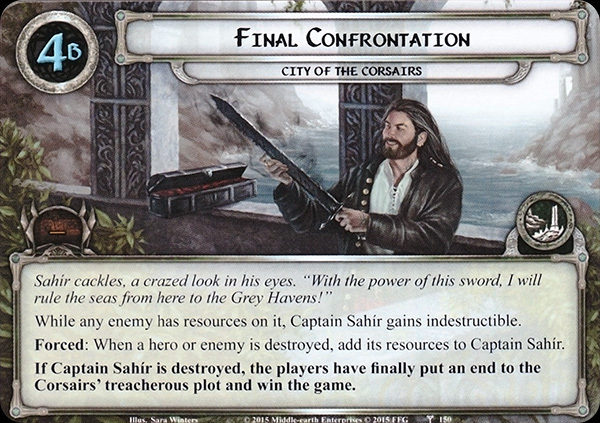 If Captain Sahír is in the victory display and each location in play has no damage, the players win the game. When Revealed: Add The Shattered Monument to the staging area. Put Captain Sahír into play, engaged with the first player. Each player searches the encounter deck and discard pile for an enemy and adds it to the staging area. Shuffle the encounter deck. Add 1 resource to each Raider enemy in play. While any enemy has resources on it, Captain Sahír is indestructible. Forced: When a hero or enemy is destroyed, add its resources to Captain Sahír. If Captain Sahír is destroyed, the players have finally put an end to the Corsair's treacherous plot and win the game. Immune to player card effects. Cannot be optionally engaged or take damage. Forced: At the beginning of the quest phase, discard cards from the encounter deck until an enemy is discarded. Add the discarded enemy to the staging area. Players cannot play attachments on The Witch-king. While The Witch-king is in the staging area, each character gets -1 Willpower. Forced: After The Witch-king attacks, he returns to the staging area unless the defending player raises his threat by 3. When Revealed: Add Na'asiyah and Captain Sahír to the staging area, enemy side faceup. Each player reveals the top card of the encounter deck. 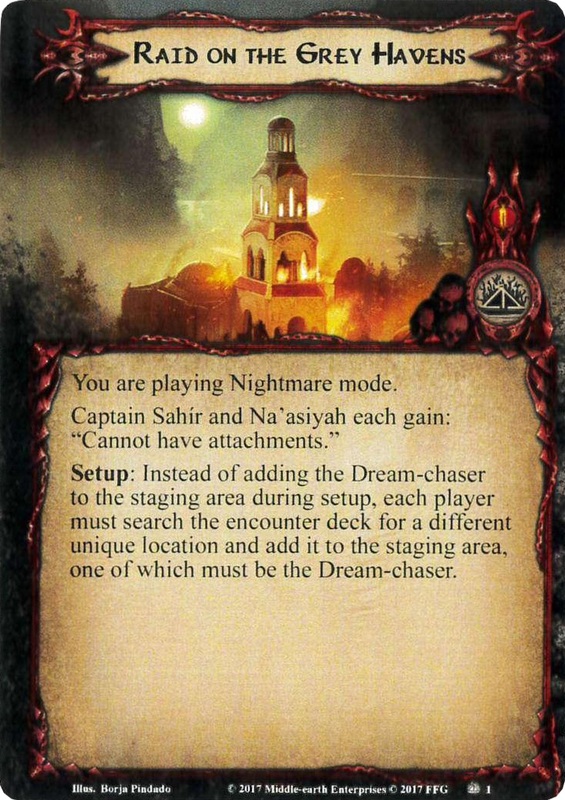 Place resources on Na'asiyah and Captain Sahír equal to the amount of damage on the Dream-chaser. Add 1 resource to each other Raider enemy in play. Resources on Na'asiyah are considered to be on Captain Sahír, as well (and can be removed as if they were on him). Each Raider enemy revealed by the encounter deck enters play with 1 resource on it. 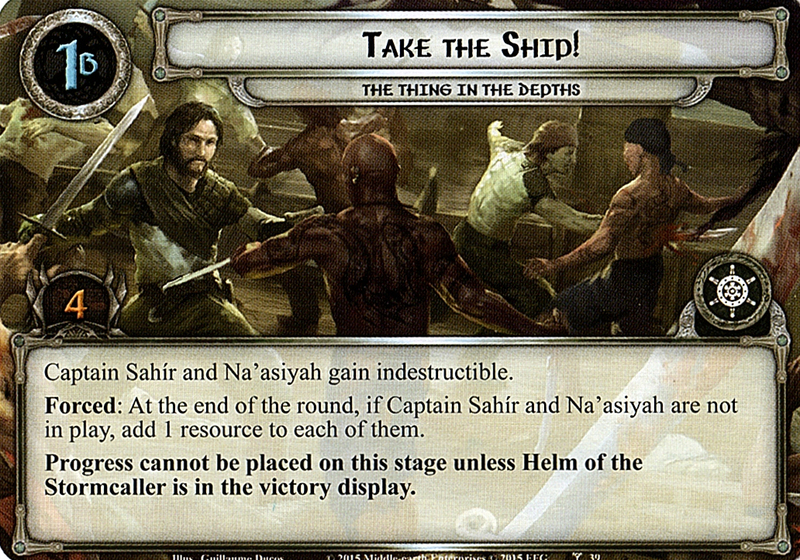 If both Captain Sahír and Na'asiyah are in the victory display, the players win the game. Any damage that would be dealt to a Captain enemy is dealt to 1 Morgul Bodyguard instead. Shadow: Attacking enemy engages the next player and makes an immediate attack, if able. Setup: Add Thaurdir to the staging area, Captain side faceup. Add 1 copy of Carn Dûm garrison per player to the staging area. Search the encounter deck for 1 copy of Accursed Battlefield and make it the active location. Shuffle the encounter deck. Thaurdir cannot leave the staging area and cannot take damage. At the end of the round, if Thaurdir is Champion side faceup, flip him. Do not discard unresolved shadow cards at the end of the combat phase. Forced: If there are 3 shadow cards dealt to Thaurdir, flip him. When Revealed: Flip Thaurdir. Then, if he is Captain side faceup, Daechanar's Will gains surge. Shadow: Flip Thaurdir after this attack. 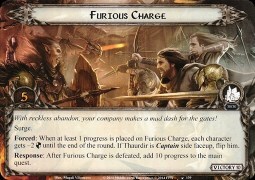 Forced: When at least 1 progress is placed on Furious Charge, each character gets -2 Defense until the end of the round. If Thaurdir is Captain side faceup, flip him. Response: After Furious Charge is defeated, add 10 progress to the main quest. Setup: Set Captain Sahír and Na'asiyah aside, out of play. Add The Havens Burn, The Dream-chaser, and 1 copy of Sahír’s Ravager to the staging area. Shuffle the encounter deck and discard cards from the top of the encounter deck until X locations with the Aflame keyword are discarded, where X is the number of players in the game. Add each discarded Aflame location to the staging area. Then, shuffle the encounter discard pile back into the encounter deck. Forced: At the end of the combat phase, deal X damage to the Aflame location in play with the lowest Aflame value. X is the number of Corsair enemies in play. Forced: At the end of the round, discard the top card of the encounter deck. the Stormcaller places progress on this stage equal to its Threat plus the Threat of the discarded card. 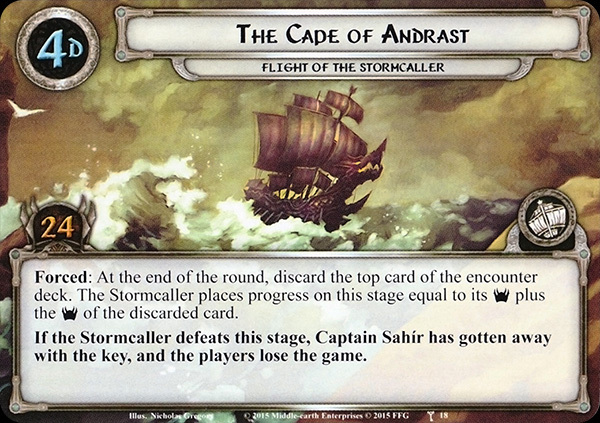 If the Stormcaller defeats this stage, Captain Sahír has gotten away with the key, and the players lose the game. 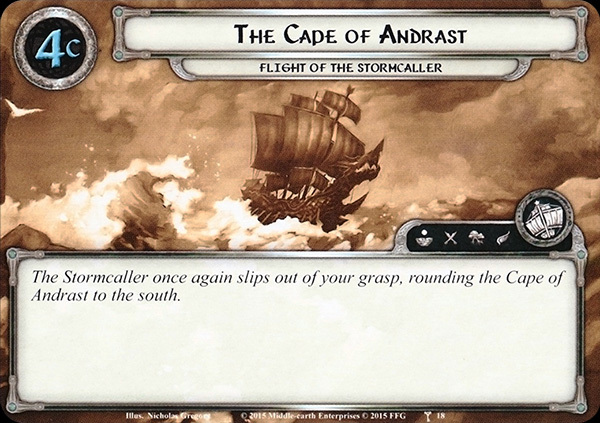 Setup: Build the encounter deck using only The Stormcaller and Corsair Raiders encounter sets, setting The Thing in the Depths and The Stormcaller Elite encounter sets aside, out of play (enemy side faceup). 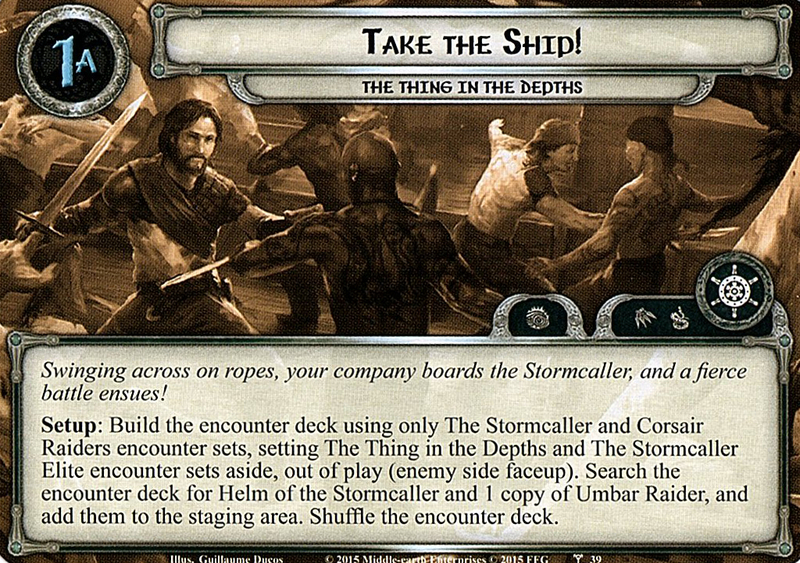 Search the encounter deck for Helm of the Stormcaller and 1 copy of Umbar Raider, and add them to the staging area. Shuffle the encounter deck. 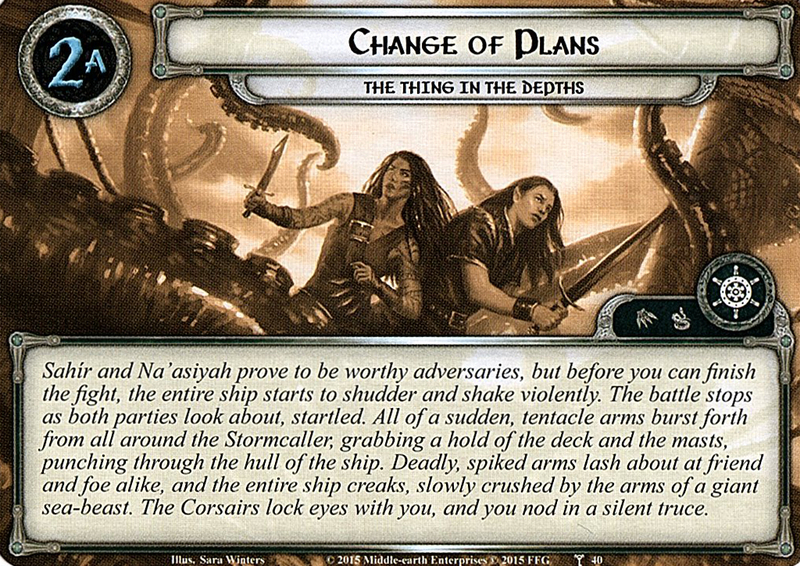 Captain Sahír and Na’asiyah gain indestructible. 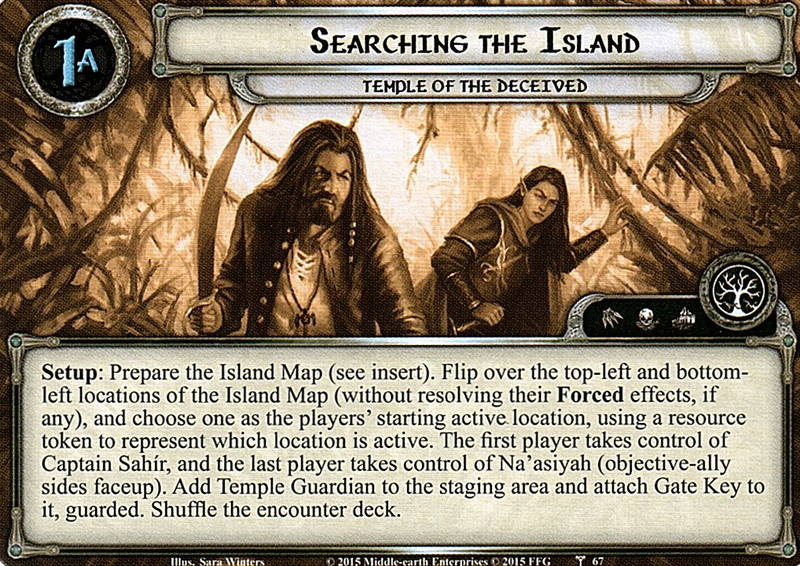 Forced: At the end of the round, if Captain Sahír and Na’asiyah are not in play, add 1 resource to each of them. Progress cannot be placed on this stage unless Helm of the Stormcaller is in the victory display. 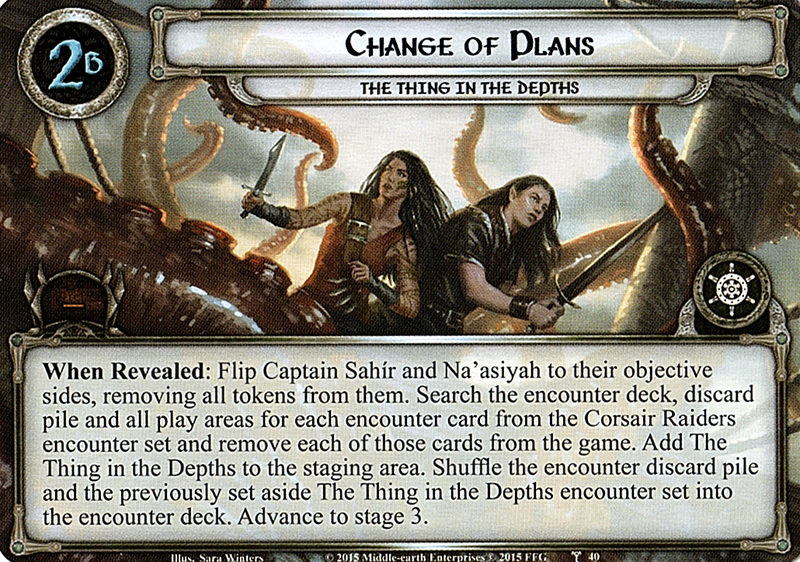 When Revealed: Flip Captain Sahír and Na’asiyah to their objective sides, removing all tokens from them. 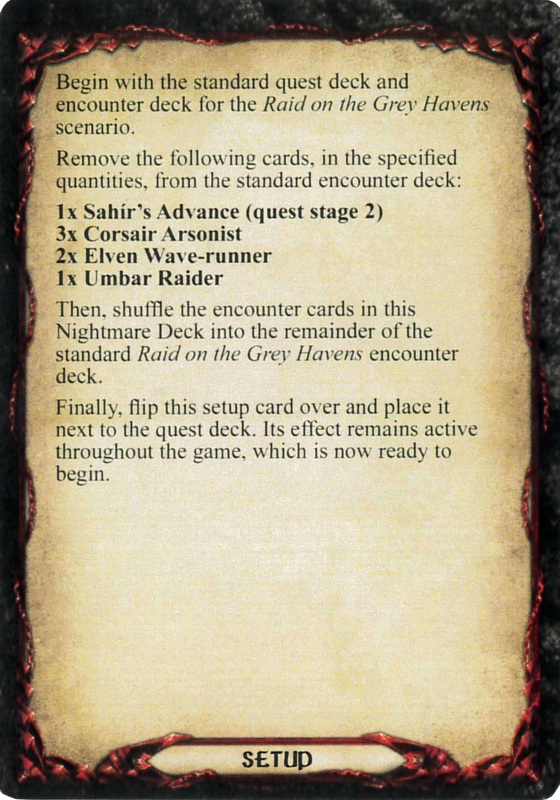 Search the encounter deck, discard pile and all play areas for each encounter card from the Corsair Raiders encounter set and remove each of those cards from the game. Add The Thing in the Depths to the staging area. Shuffle the encounter discard pile and the set aside The Thing in the Depths encounter set into the encounter deck. Advance to stage 3. Immune to player card effects. Helm of the Stormcaller gets +1 quest point for each resource token on a Raider enemy in play. Forced: When Helm of the Stormcaller becomes the active location, add Captain Sahír and Na’asiyah to the staging area from out of play (enemy side faceup). Setup: Prepare the Island Map (see insert). 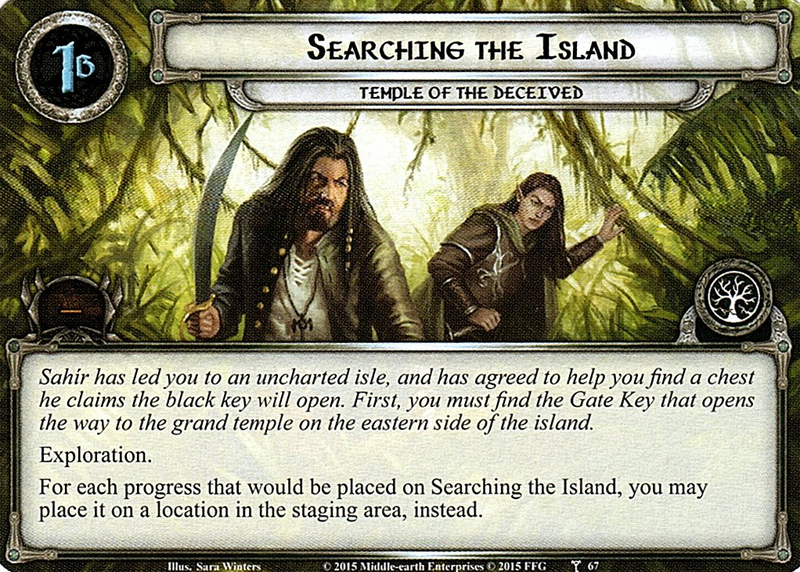 Flip over the top-left and bottom-left locations of the Island Map (without resolving their Forced effects, if any), and choose one as the player's starting active location, using a resource token to represent which location is active. The first player takes control of Captain Sahír, and the last player takes control of Na'asiyah (objective-ally side faceup). Add Temple Guardian to the staging area and attach Gate Key to it, guarded. Shuffle the encounter deck. For each progress that would be placed on Searching the Island, you may place it on a location in the staging area, instead. Setup: Set Shrine to Morgoth aside, out of play. Prepare the Grotto deck. 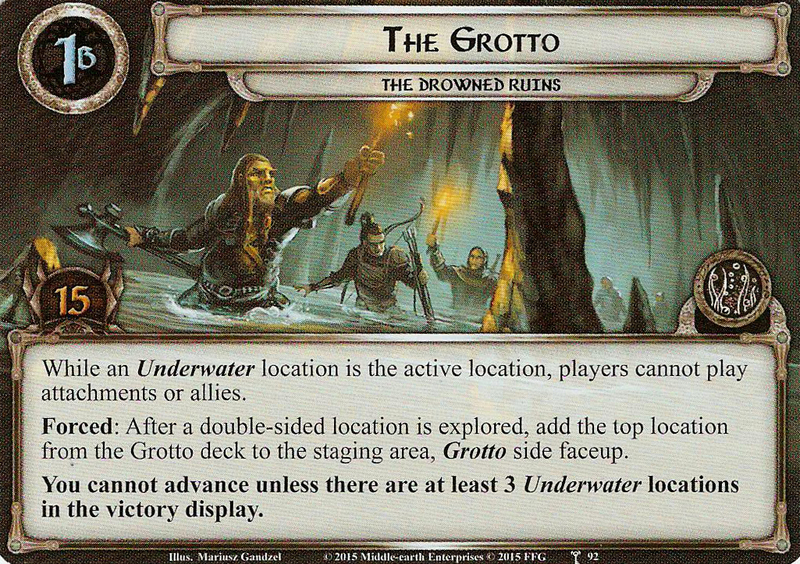 Add the top 2 locations from the Grotto deck to the staging area, Grotto side faceup (the top 3 instead if there are 3 or more players in the game). The first player takes control of Captain Sahír, and the last player takes control of Na'asiyah (objective-ally sides faceup). While an underwater location is the active location, players cannot play attachments or allies. 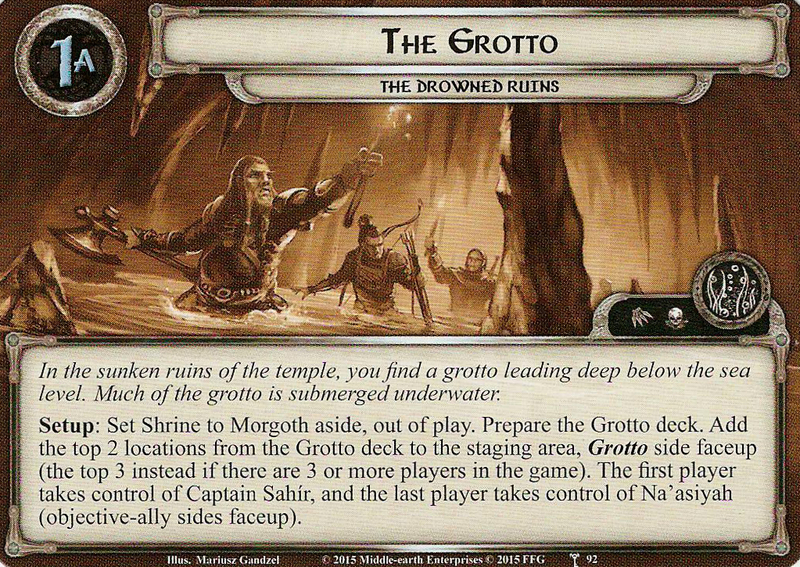 Forced: After a double-sided location is explored, add the top location from the Grotto deck to the staging area, Grotto side faceup. You cannot advance unless there are at least 3 Underwater locations in the victory display. When Revealed: Make the set aside Shrine to Morgoth the active location, Grotto side faceup. Captain Sahír flips to his enemy side (removing all tokens) and makes an immediate attack against the first player. Remove Captain Sahír from the game. Each player searches the encounter deck and discard pile for an Undead enemy and adds it to the staging area. Shuffle the encounter deck. While an Underwater location is the active location, players cannot play attachments or allies. 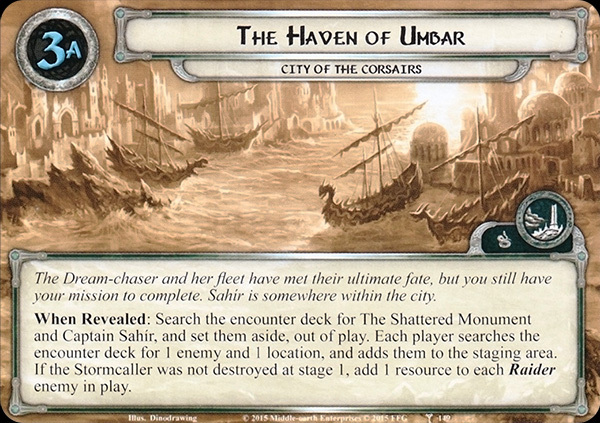 When Revealed: Search the encounter deck for The Shattered Monument and Captain Sahír, and set them aside, out of play. Each player searches the encounter deck for 1 enemy and 1 location, and adds them to the staging area. If the Stormcaller was not destroyed at stage 1, add 1 resource to each Raider enemy in play. X is the number of resources on The Corsair Fleet. The players cannot travel here unless there are at least 3 Ship locations in the victory display. Travel: Each player searches the encounter deck and discard pile for a Corsair enemy and adds it to the staging area. One of those enemies must be Corsair Captain, if able. When Revealed: Each player takes control of each ally he owns in the staging area and exhausts it. The first player adds Minas Tirith, Grond, and The Witch-king (Captain side faceup) to the staging area. Each other player searches the encounter deck and discard pile for a different enemy and adds it to the staging area. Shuffle the encounter deck. 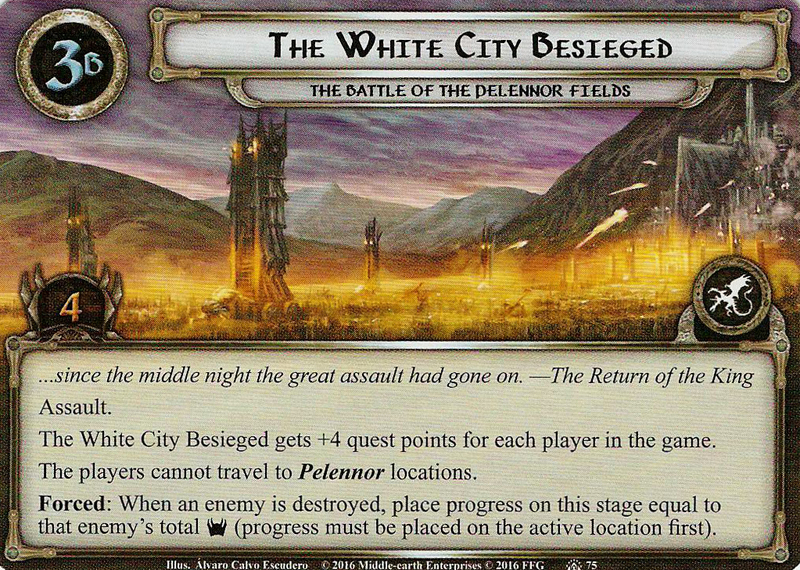 The White City Besieged gets +4 quest points for each player in the game. 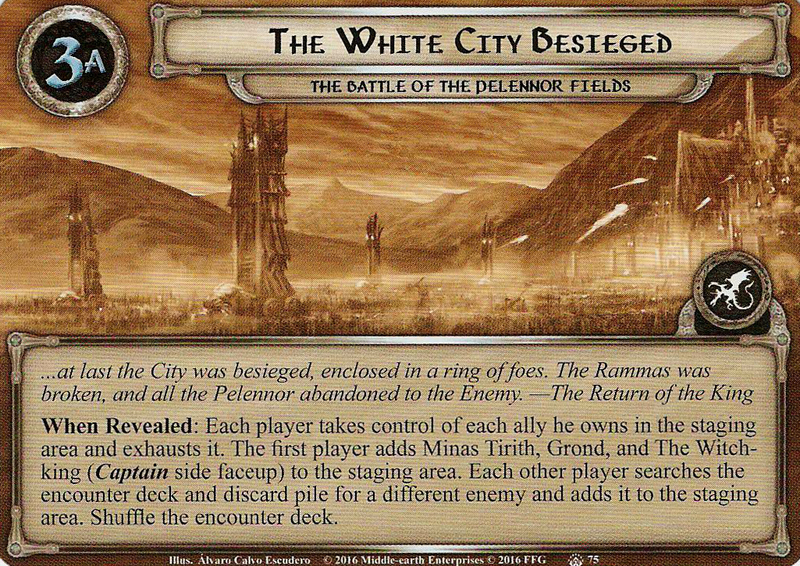 The players cannot travel to Pelennor locations. Forced: When an enemy is destroyed, place progress on this stage equal to that enemy's total Threat (progress must be placed on the active location first). Each Captain enemy gets +1 Defense. Forced: At the end of the round, heal all damage from each Captain enemy in play. Shadow: Heal all damage from each Captain enemy in play. Forced: When Banks of Morgulduin is explored, deal it facedown as a shadow card to a Captain enemy. Shadow: If attacking enemy is a Captain, deal it 3 additional shadow cards for this attack. While Ephel Dúath is in the staging area, each Captain enemy gets +2 Attack. 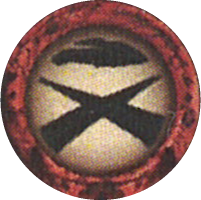 Shadow: Defending player must either place 1 progress token on To the Tower or treat this attack as undefended. You are playing Nightmare mode. Captain Sahír and Na'asiyah each gain: "Cannot have attachments." Setup: Instead of adding Dream-chaser to the staging area during setup, each player must search the encounter deck for a different unique location and add it to the staging area, one of which must be the Dream-chaser. 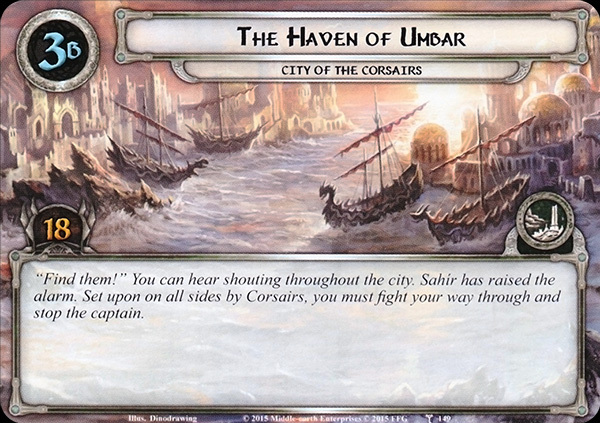 Begin with the standard quest deck and encounter deck for the Raid on the Grey Havens scenario.\r\nRemove the following cards, in the specified quantities, from the standard encounter deck: 1x Sahír's Advance (quest stage 2) 3x Corsair Arsonist 2x Elven Wave-runner 1x Umbar Raider Then shuffle the encounter cards in this Nightmare Deck into the remainder of the standard Raid on the Grey Havens encounter deck. Finally, flip this setup card over and place it next to the quest deck. Its effect remains active throughout the game, which is now ready to begin. You are playing Nightmare mode. 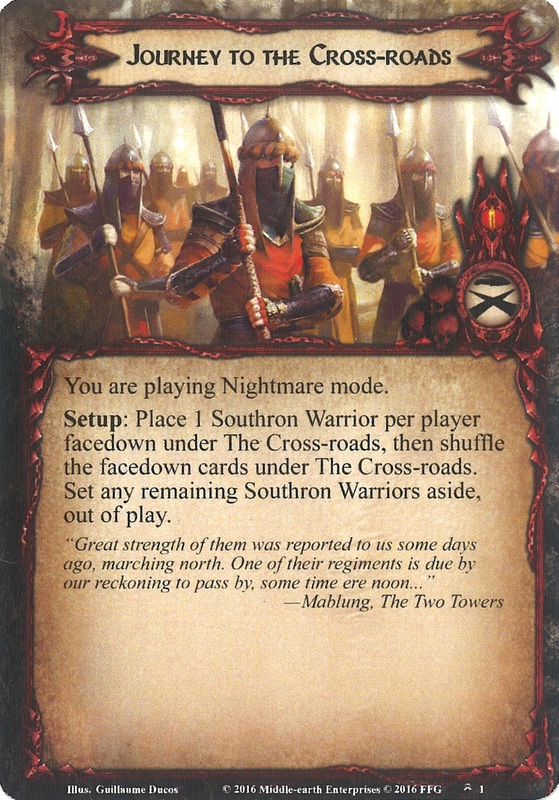 Setup: Place 1 Southron Warrior per player facedown under The Cross-roads, then shuffle the facedown cards under The Cross-roads. Set any remaining Southron Warriors aside, out of play. Begin with the standard quest deck and encounter deck for The Journey to the Cross-roads scenario. Remove the following cards, in the specified quantities, from the standard encounter deck: 1x Captain of Harad 1x Henneth Annun 2x Southward Road 4x Hills of Ithilien 3x The Dark Lord's Summons Then, shuffle the encounter cards in this Nightmare Deck into the remainder of the standard the Journey to the Cross-roads encounter deck. Finally, flip this setup card over and place it next to the quest deck. Its effect remains active throughout the game, which is now ready to begin.